I will complete the latest campaign with sharpening by writing some words about sharpening steel. In many ways this is the minimum of maintenance on knives. There are many theories on steeling knives on the internet. There are also several theories on how to hold it in different directions and so on. The idea with this steel is to correct the edge, remove some metal and to feel for damages. It only sharpens to some degree. I found the old types with a fine surface to be the best. The Wenger New Ranger is a rather robust blade with flexibility so such a device can be valuable to use frequently. For me it is about sliding the edge on both sides to feel what is going on with the edge and to hold my edge for a longer time. If you do a full maintenance with stones then the sharpening steel can be very valuable to use in between to remove the burr and substances during that process. My advice is to find some old worn steels that you can get for a minimum cost and use this with very good results on SAKs. Make sure that it got a fine surface all over and that the surface is without damages. Maybe there is a cook nearby you can ask that has used on fish knives for many years with steel. In my experience it is not smart to throw away any stone, steel or devices that are worn. It will come to use and the result using this old one is very good. The most durable old steels are the ones that had a fine surface to begin with because they are less prone for damaged areas. Good luck! PS the steel can be used in many directions depending on what to prefer. As said sharpening steels can be used in many directions. They usually got a good handle like this and you can point the tip up or down. You can also use it more horizontally. If you lift your elbows up then you get a correct motion. The sharpening steel on the pictures above is not stainless steel. Using stainless steel blades on this works very well and it is also into the experiment to see if such a device will make the stainless steel sharper. Some steels today or before are more abrasive and every abrasive material can sharpen steel one way or another. Basically also a more fine or smooth surface will also sharpen steel one way or another. The main purpose is like I said to maintain the edge longer and to remove metal and substances. My impression with them is that they correct the edge. I did a test on the New Ranger blade that is a bit less sharp from use and I ran it along the steel some strokes. It became sharper and in my opinion it is several reasons for this. It corrects, remove some metal and substances + because it is abrasive it sharpens to some degree. Today you can get honing steel or different design configurations that got different abilities. The traditional ones like I show today is bare minimum but very effective. Maybe the best way to determine is that the steel got fine-lines or a structure that is fine. Abrasive is maybe not the best words for the traditional ones. Anyhow the fine-lines also cause abrasive abilities. It does sharpen to some degree because I have tested it on edges that I knew was clean and straight. There was a question on old steels and surface. There is no problem that there is much patina on them or that there are some minor pitting. There is also no problem that the surface is a bit more worn some places. The old types with fine surface works very well when worn. The only problem is if you got notches in the surface that would cause the edge to hit during the motion. I recommend testing it out because it is very effective as said. The reason for why carbon steel and similar gets patina is because it reacts to substances and food stuffs over time. It is not stainless so it will rust and corrode. Carbon steels will get a patina from age no matter what as well. That the fine surface is a bit in chaos with micro notches, lines and structures is only a big advantage. It is also my impression that sharpening steels that are traditional is bare minimum maintenance and because it is not like the honing rod that are abrasive. These removes much more metal and it is very different. Further about the steeling i would like to mention what’s been my topic for a long time about the pressure you apply during maintenance. I am not a fan of round diamond coated sharpening rods on a flat edge. They are great on serrated and wavy edge knives. When you use traditional sharpening steels with fine-lines along the design or similar structures it will cause positive advantages on blades. It is round and therefor it will cause very high pressure if you are hard handed during the motion. Moderate pressure is what you need and sliding the edge along the design. If you use extra abrasive diamond coated rods then you need to practice a bit before perfect. This removes much more metal and cannot be used as frequent as traditional ones because you will wear the knife to fast. There are ceramic rods or diamond coated ones with extra fine surface and these can be used with good results. It will maintain, correct and sharpen all the same. That is very effective. However it is not as carefully as flat stones because of the difference in contact area. From experience it is because the traditional steels are bare minimum that you do not have to sharpen the knives so often and you save the edge for a longer time. From time to time it is unavoidable that you have to sharpen further with flat stones. I recommend fine 600 grit for most tasks. If you use fully polished surface sharpening steels then these will correct the edge but they are not as effective removing metal, burr and substances. "I recommend reading my pages on sharpening to the left. It is important to remember what is considered a superior edge. A superior edge has been sharpened with a minimum pressure and correct angle. This goes for knives in most HRC ranges. A knife edge does not like to be corrected to many times because it will weaken the edge over time. So if you only slide it along the steel then you are carefully. 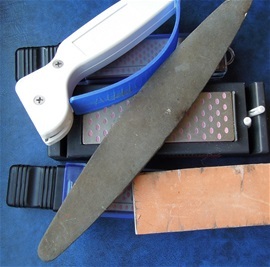 A superior edge likes to be sharpened on a flat stone with some width. It must not have been moved side to side, rolled or get a too slim edge. The thickness and type of steel + what it is intended to be used on determines the edge angles"
For professionals that teach maintenance i would recommend taking extra time with the students. Today there are several electric devices, carbide sharpeners with fixed angle ones, also called “fast sharpeners” and several fixed devices on the market. It seems to me that the most effective is flat diamond stones or natural stones. There are two main problems and one is that many do not do maintenance and some does and destroys the edge completely. It is important to teach about using light pressure and simple technics. In the old days people could use wood and round stones found in the outdoors and get by with them. It is important to teach that if you touch up the edge from time to time it will remain for a longer time. Today i will show you my latest sharpening steel that i found in a used store. It only cost me 6 NOK and it is in full order. It is an EKA Sweden. It is very good on the stainless steel on the Wenger New Ranger knives. The advantage with this rod is that it is very small and easy to control for a fine edge and the surface on the rod is fine. Never use force when using such devices. Find the angle and slide the edge on both sides a few times. The advantage with this is that you do not have to remove much metal as when you are using a fine diamond stone. I really love fine surface diamond sharpeners for my SAKs. If you have experience and training you only use the diamond stone with a very light pressure to maintain the edge sharpness and profile. With the sharpening steel you can correct the edge and make it longer in between each time you have to remove more metal. 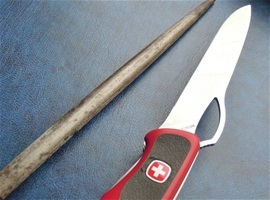 The rod is also very useful to use after full sharpening maintenance to remove burr and pollutions on the edge. If you take the time to read the information above and my other pages you will find much information on helpful maintenance for your edges. Economical care and maintenance of blades. All blades require maintenance, sharpening, cleaning and oil and one point or another. I would not recommend starting up with any types of electrical wheels because without practice you will remove too much metal. It is many times unnecessary much metal removed. With experience comes correct use of blades and proper care with maintenance as well. Sharpening steel, rods and similar can be made of materials that removes more metal and therefor fulfill a bit different purpose that the traditional steels do. Many likes to polish the edges because if proper done it can make an edge that could last longer. For sure this sharpening rod will remove some metal each time you use it. Its main purpose is to function as a corrector and for prolonging each time more metal must be removed. With experience you will learn that folding the edge back and forth will weaken the edges significantly and it is important to learn correct motion and pressure you can apply on edges. The rod is a free motion device that allows sliding of the edges without any damage. It is not necessary to do a full sharpening job each time you have had the knife with you or used it over some time. The edge can take some corrections but if you have folded areas on the edge with chips and damages then this sharpening steel will not be of much valuable help. It is more for the small correction, very light sharpening and removing dirt, pollutions and substances. It is a device for an edge with a high level of correct profile and angle. Many like to have the edge super sharp at all times and I therefore recommend testing similar products that I have shown today and feel for yourselves how quick small corrections and substances removed can bring forth the little extra again. If you learn to sharpen one side in one complete motion it will usually require repeating this a few times to restore the edge. Let us make an example with 4 times on each side in an alternating fashion. You can finish this by having just a bit sharper angle one time on each side with a lighter pressure. After this the edge will have some burr that can be removed by cross motion or using the sharpening steel. Thank you for following me today! Today i would like to write some more words about sharpening and touch some of the topics i have discussed her on sakhome.com. I am all for all types of knife steel and different knives for harder tasks. In some cases people choose to get a fixed blade knife with extreme qualities. This can be High Carbon or stainless steels with much harder HRC. When you rely on one blade for everything then the best is to get a knife for tougher tasks just in case. If people decide to go for super steel then sharpening may be a bit different. It may be longer in between you have to do maintenance and sharpening. This does not mean that sharpening and maintenance is less important to know. It may be even more demanding and necessary with practice when such qualities are used. In the field it can be difficult to use a Tormek or electrical driven wheels. One must rely on knowledge with stones and products. Some would bring large water stones in the outdoors. Some would use diamond coated stones and devices. No matter on how one twist and turn it must be so that people can do maintenance and sharpening on their own blades. It is fully possible to send your blade to a professional sharpener. The best is to know some personally and be able to repair chips and damages in the field. If you use super steel blades very hard in the outdoors then damages will occur no matter what. The Swiss Army Knife is a bit different in philosophy because functions in combination with the blade can be used to save the knife from the hardest tasks. It all depends on what you prefer and I totally understand the one knife philosophy too. I find it a bit dangerous to not be able to do simple maintenance. You can do it and I know in time it will be very fun to do. Sharpening steels can be helpful even on super steel blades. The edges on bushcraft blades can be Scandinavian Grind or types of convex grinds that can take impact the best. Remember when you choose a knife what kind of maintenance is required to be able to continue the edge on it. Many knives that have only seen some use will have an edge that is very different from what it originally came with. There can be several reasons for this. One of the reasons are that it is difficult to continue it and another reason can be that small damages may have happened and people have tried to repair it by free hand with stones. Many times the best with hard use fixed blade knives is to use large water stones. The absolute best may be Tormek or electrical driven wheels with a fixture for the angle. This will require practice! If you have patience it can be possible to use diamond coated stones and Lansky systems with very good results. "The answer to all maintenance and sharpening is practice and the amount of pressure that must be applied. It depends on what materials you use to remove metal with"